The Catholic Church of Saint Gabriel had its official arrival in 1987 but the spirit of the mission parish had been alive for a number of years, with the help of the Holy Spirit and scores of determined area Catholics. The history of the parish is one of faith and dedication, a history that paralleled that of the early Church when believers met in each other's homes to pray together as one community and celebrate the Eucharist. So too did the Catholics of Fayetteville, county seat for sprawling Fayette County just a half hour from the bustling downtown of Atlanta, state capital. There was no Catholic church in Fayetteville, noted for its farms and extraordinary scenic charm, but that did not dampen the spirit of God's pilgrim people as they gathered around the table of the Lord and began their journey of faith. It was a missionary journey made with enthusiasm and fortitude, with persistence and prayer, and in the company of the Holy Spirit. On a blistering August 1, 1987, the thermometer sizzled at 102 degrees as the first "official" Mass for the families of Saint Gabriel was held in the downtown American Legion Post 105, generally known as the "log cabin," just down the street from the historic 162 year old courthouse. As eager chatting families arrived in the mid summer heat, it became obvious this was more than a handful of the faithful. Some 225 adults and 75 children soon filled the tiny building with excitement and song. This special worshiping community must already find a larger space. In September, religious education classes began in the Fayette Presbyterian Church. A festive parish picnic was held that same fall as well as a colorful Harvest Fest for the delighted congregation. The Archdiocese had purchased 7.2 acres at the intersection of State Highway 92 and Antioch Road in 1979, anticipating a future home for the mission. During the formative years, the mission experienced ongoing delays, changes, illnesses but the enthusiasm and dedication remained high. A small downtown office opened its doors on Commerce Drive to handle parish business matters. The first priests working with the faithful lived in a downtown rental apartment. Over the years, members of Saint Gabriel's mission continued to meet as a worshiping community, sharing the worship space of other denominations as well as public school facilities. They were always on the move, heading for bigger spaces as the numbers grew. At its earliest stage, members of the mission were activity involved in the community, providing social outreach and other needed services, each member fulfilling his or her gifts of Baptism. First Communion was celebrated May 7, 1988 for 19 children and on June 3rd a Mass was celebrated for graduating Seniors. Archbishop James P. Lyke came to visit his Fayetteville flock in September 1990 and confer the Sacrament of Confirmation. A town hall meeting in the fall chose the parish name as Saint Gabriel the Archangel. As Christmas neared, two signs were proudly posted on Antioch Road, foretelling the coming of the mission's very first home. During August 1991, Franciscan Friars arrived at St. Philip's with Father Patrick Mendola, OFM, Conv. as pastor and his associates Father Julio Martinez and Father John Koziol. That was the start of a very caring chapter of Franciscan service to the Fayetteville mission community. Also in 1991, the Archdiocese purchased additional acreage on Antioch Road, selling the original corner site and providing Saint Gabriel's with 16 acres for its growing family. In July 1992, Father Joseph Beltran became the mission's first administrator. Father Beltran suffered a stroke during the winter and in May 1993 he resigned due to illness. The mission's Deacon Al McHugh was then named acting administrator. On the 3rd of June, Father Paul W. Berny was appointed by the Archdiocese as administrator of the mission. Father Berny had served in several Atlanta parishes, including St. Philip's, and had just completed 10 years service as a chaplain in the Air Force. He brought with him extensive credentials and expertise in music and liturgy as well as those of a bona fide chef. On September 29, the feast day of the mission, an official ground breaking and blessing of the land was held, Archbishop John F. Donoghue presiding along with Father Berny and other priests who had served the community. Two days later, October 1st, the Archdiocese formally established Saint Gabriel's as a canonical parish and a joyful parish welcomed the naming of Father Berny as its first pastor. The pilgrim people's journey was well on its way. To start the new year of 1994, a nearby residence was bought on Antioch Road for use as a parish rectory and administrative offices. After renovation efforts by the entire parish family, the rectory was completed in March and the final office relocation occurred in June. The days of construction and activity began in earnest as the building slowly began rising as a reality. 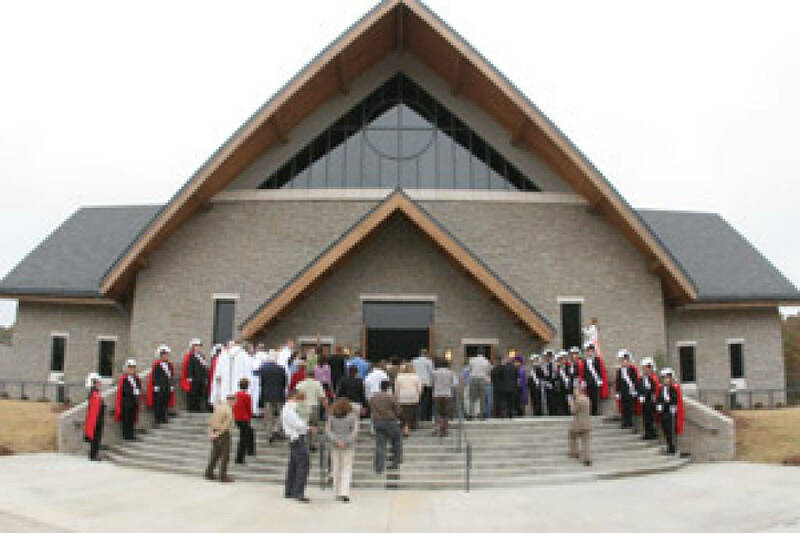 July 29, 1995 was a day of joy for hundreds of happy parishioners as the blessing of the Multi Purpose Building and Dedication of the altar was held by Archbishop Donoghue. Eight days of celebrating followed the happy milestone with concerts, picnics, teen events, parish banquet, ice cream social, and a 5K walk to the new site. The entire Fayetteville community joined in the celebrations. On August 1st 1997, a happy parish family again gathered at the tiny American Legion Hall to celebrate the Eucharist, commemorating the 10th anniversary of that first scorching day. The parish has over 500 families registered, an extensive religious education program for all ages, active year round social activities, a Christmas parade of homes, a festive Mardi Gras celebration, outstanding liturgical dancers, an excellent music program and choir and a myriad of programs for all. As when it started, Saint Gabriel's ministers to the community, helping the homeless downtown, providing food for an AIDS hospice, an Angel Food program for the needy, and an active ministry of care at Fayette Community Hospital and many special social outreach services. This parish family lives the words of Saint Gabriel sent to bring the good news. In June of 1998, Father Timothy M. Hepburn was appointed the second pastor of the parish by Archbishop Donoghue. Father Tim, a young vibrant priest, was known for his love of music as evident in his many powerful homilies that often included his playing of the guitar for effect. In 2000, Father Daniel Toof, who was a seminarian classmate to Fr. Tim, was called upon to lead our parish. This native of Nebraska brought with him a positive influence on our parish as well as our first official parish dog, a cocker spaniel named Honey. Father Jimmy Adams was the next called to be our pastor played an instrumental role in the development of a group called "Amigos for Christ". Amigos for Christ are a group that supports a Catholic Parish in Nicaragua, Central America. Each year since Fr. Jimmy's arrival, members of St. Gabriel including Life Teens are encouraged to make a mission trip to our Sister Parish, St. Gabriel, in Nicaragua, which we helped, establish. Under Father Jimmy, our dreams for a new, larger church became a reality. In 2007, Father Karl Duggan came and brought a youthful sense of energy to the parish. Father Karl has helped to kick off many new ministries to help us come together more often as a parish family. Under his leadership, the old sanctuary was converted into offices and a parish hall. A formal chapter of St. Vincent de Paul was established in 2008 with the goal of providing expanded service to those in need. In July 2009, Father Michael McWhorter was assigned as our pastor and shepherd. He led the parish with tireless energy until his untimely passing in April 2016. In July 2016, we began a new chapter as we welcomed Father Richard Vu to St. Gabriel. Working together, we strive to follow in the footsteps of Jesus Christ and to be his hands and feet to our parish family and the community around St. Gabriel.